Brian Carty was born on the 19th of November 1943. During his short but very successful running career, when he was in his early forties, Brian ran for Shettleston Harriers. He worked at the BMC car factory in Bathgate. Hugh Mitchell, who had been a prominent, medal-winning Scottish marathon and ultra-marathon racer in the 1960s, became Brian’s advisor and trainer. 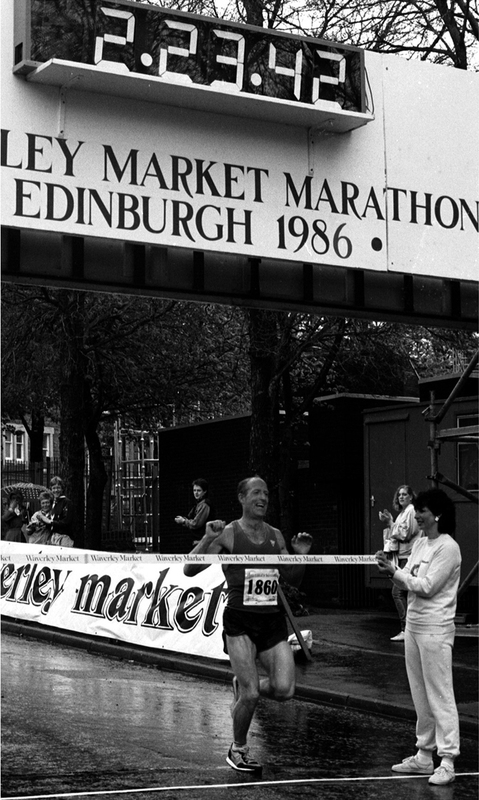 In 1983, Brian Carty ran what seems to have been his first marathon – the Scottish Championships from Meadowbank, Edinburgh. The result was: first Peter Wilson (Aberdeen AAC – 2.26.20); second Colin Youngson (Aberdeen AAC – 2.28.46); third Evan Cameron (Edinburgh Southern Harriers – 2.29.30); and fourth Brian Carty (unattached – 2.33.45). An impressive debut, aged 39! He must have joined Shettleston shortly after this event. 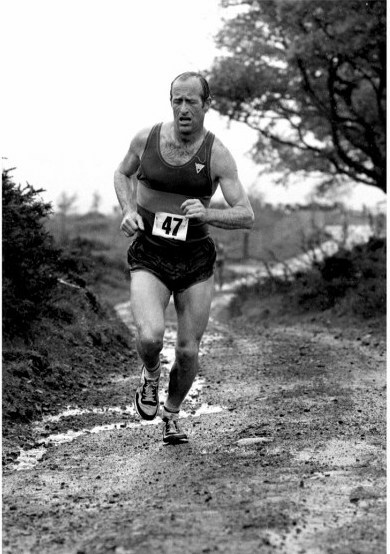 Brian Carty breaking the record in the 1985 Cairnpapple Hill Race, which was the Scottish Veterans Championship. In the 1985 Scottish Veterans Cross Country Championship at Callendar Park, Falkirk, in a particularly competitive field, Brian finished 6th. Then, in the famous Tom Scott Memorial 10 Miles Road Race, he crossed the line as first Veteran in 52.17 and was presented with the Turnbull Rose Bowl. In the Inverclyde/SVHC Marathon he was timed at 2.29.28 behind Allan Adams and David Fairweather. That November, aged 42, he ran for Shettleston Harriers in the prestigious Edinburgh to Glasgow Road Relay. The 1986 SAAA Marathon, which took place on the 1st of June, was part of the Edinburgh Marathon which followed a tortuous route from outside Meadowbank, up to the Royal Mile, down Lothian Road, right along Princes Street and back to the start. Then it continued to Seafield, Cramond and back to Seafield before climbing up to the start/finish. This race was to be the battle of the veterans – Donald Macgregor, the favourite, and Brian Carty of Shettleston Harriers. The latter, a steadily improving, strong-looking man, had finished second in the Scottish Veterans Cross-country Championships, although he much preferred road racing. Brian remembered that he was wary of going too fast, too soon, on a hilly course, so he stayed with the second pack some distance behind the group of six leaders. As far as he could see, Don Macgregor was playing ‘cat and mouse’ with them. Eventually Donald went off into a clear lead, until Brian came through and caught him at Cramond (17 miles). Carty’s coach, Hugh Mitchell, had advised him, ‘When you catch someone up, talk to them – it shows that you’re fresh.’ So Brian asked how Donald was feeling, and shortly afterwards began to draw away. He finished very strongly indeed, while Donald faded. Although he felt good all the way, he was a lone figure, especially through Seafield, because of the lack of spectators. Only at the finish was there applause, as Brian Carty won the Edinburgh Marathon and the Scottish Marathon Championship in 2.23.42, a personal best, with Donald second in 2.27.30 and Robert Marshall, who much, much later became a British Masters M65 Cross-Country Champion, third in 2.27.59. Brian’s training was not unlike Hugh Mitchell’s twenty years previously. Overcoming initial reluctance, he gradually built up to a very strenuous regime indeed. On weekdays he might run thrice: twelve or fourteen miles to work at British Leyland; four miles fartlek at lunchtime; and another ten to twelve miles home. He remembered many hard sessions in the Bathgate hills. In total he might run 120 or even 150 miles per week. So his 1986 triumph was hard-earned indeed. 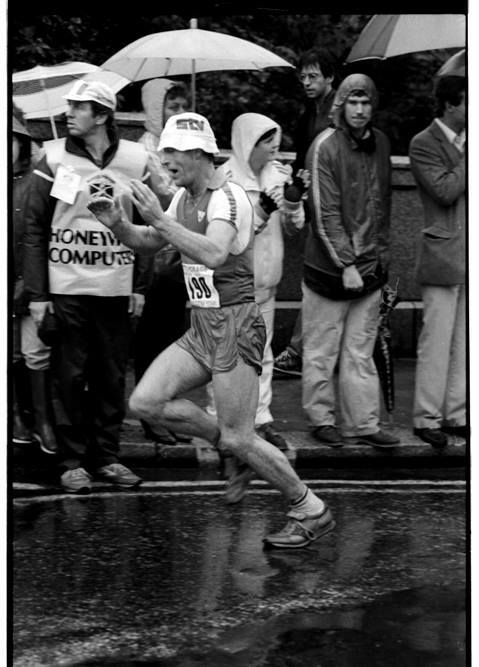 Apparently, Brian Carty was not officially entered in the rain-swept 1986 Glasgow Marathon, but someone could not start, so Brian donned the spare number and, in a rather ineffectual attempt to conceal his identity, wore a hat. Brian running the 1986 Glasgow Marathon – in disguise! 1987 was also a good year for Brian Carty. In the Scottish Veterans CC at Huntershill he improved to 2nd, behind Brian Scobie, but just ahead of David Fairweather. Then he showed greatly increased speed in the Tom Scott Memorial 10, recording 50.01 to secure the title of First Veteran again. On 26th April, the Lochaber Marathon featured a duel between two SAAA Marathon winners. Colin Youngson, aged 39, set out over-confidently, building up a two-minute lead by ten miles into what he thought was a headwind. However after the turn he discovered that there was another headwind to struggle into on the way back, and also that Brian Carty was pulling him in steadily. When Brian caught up at 22 miles, Colin assumed he was ‘dead and buried’ but Brian, true to form, started chatting pleasantly! Too knackered to respond in more than grunts, Colin dropped in behind for a bit of shelter. Just before 25 miles, he had recovered enough to make a last-ditch effort, ran very hard for half a mile and hung on desperately to the finish. Eighteen seconds later, a fresh Brian, such a genuinely nice guy, rolled in to congratulate Youngson who was panting helplessly against a wall. Colin’s 2.26.15 was a course record until Fraser Clyne raced Lochaber. Brian Carty, aged 43, had the consolation of winning the Scottish Veterans Marathon title. Then, in the 1987 Glasgow Marathon, when more than 5000 ran, Brian Carty of Shettleston Harriers finished an excellent 17th and First Veteran, in 2.25.18. The 1988 Scottish Veterans CC at Dalmuir Park, Clydebank, was run in a blizzard and Brian Carty, aged 44, ended up 14th. Sadly, Brian Carty had to give up running after a bad accident at work when his arm got dragged into a machine. However he made a real impression and was liked and respected greatly by runners who trained or competed with him.